Among my collection of childhood memories is this folder which I decoratively titled, "Fun Stories to Read." I'm assuming this was a school project - submitted in the 3rd grade, yet there's no grade recorded anywhere in or on the folder. So, I'll let you grade it yourself. I'll post all of the stories from this collection - a few at a time - beginning with this one, for which I have photographic illustration (lest you think I go around making up stories about me & my dad). 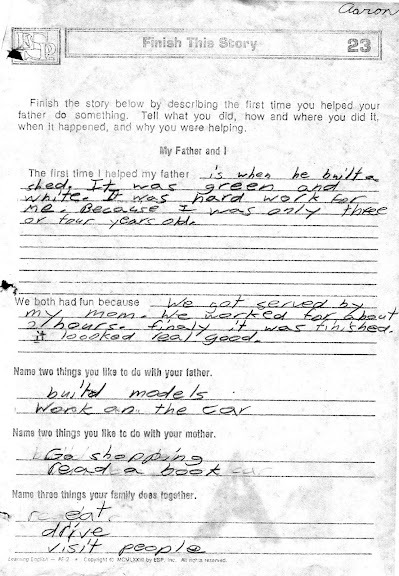 The first time I helped my father is when he buillt a shed. It was green and white. It was hard work for me. Because I was only three or four years old. We both had fun because we got served by my mom. We worked for about 2 hours. finaly it was finished. it loooked real good. Name two things you like to do with your father. Name two things you like to do with your mother. Name three things your family does together. 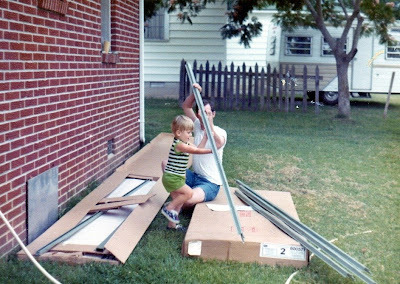 Me & my dad building the shed around 1973-74. That shed still stands today. That's really cool! Things like that are fun to look back on. My mom still has a framed letter I wrote that won a "Greatest Dad in the World" contest when I was about 8. What was that country radio station there in Sheridan? KKYK? KKYK was crazy Craig O'Neil.